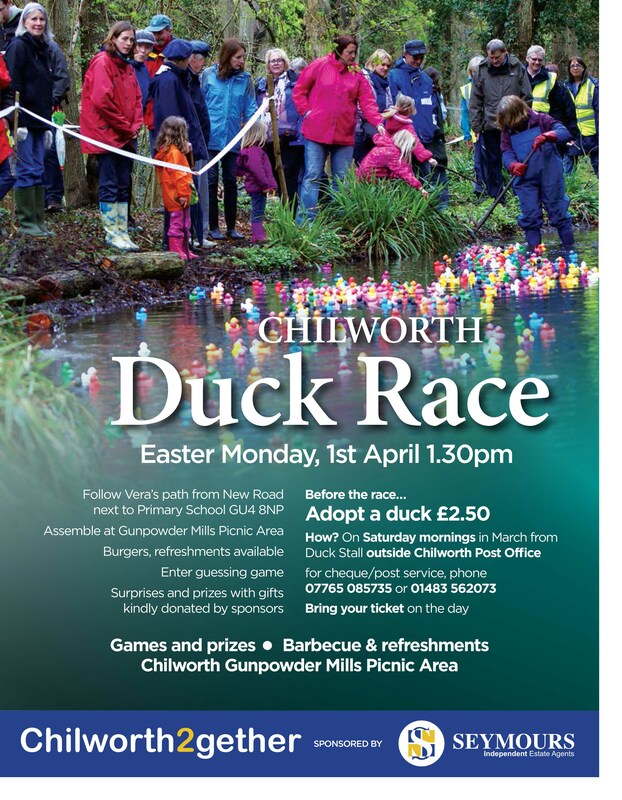 Plastic ducks are in a row and at the ready for Chilworth2gether’s annual Duck Race, which is sponsored by Seymours Estate Agents and starts at the Gunpowder Mills Picnic Area on Easter Monday, 1 April, at 1.30pm. The community group, which stages the event every year to raise funds for communal facilities throughout the village, is now on the hunt for willing duck adopters. Surrey residents are being asked to adopt a duck for £2.50 from outside the Chilworth Post Office on Saturday mornings, which will then be floated down the River Tillingbourne with hundreds of competing multi-coloured ducks. Those who have adopted the winning ducks will collect a prize and funds raised from the event will be used to purchase new picnic tables for the football pitch and play area. Funds raised at last year’s event went towards flower planting schemes, millstones for the entry portals to the village and new picnic benches for the Gunpowder Mills. A barbeque and refreshments will be available on the day and games and prizes will be on hand for the children. For more information or to arrange adoption of a duck contact Maggie on 07738 429716.